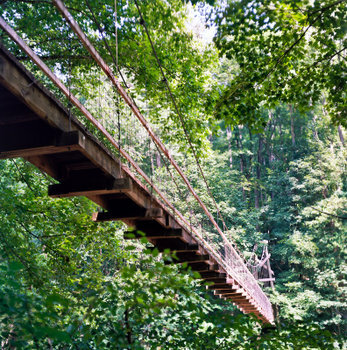 A 319-mile backcountry trail that spans the Daniel Boone National Forest and the Big South Fork National Recreation River and Recreation Area. The Sheltowee Trace map was released in 2014 (north) and 2015 (south). Connecting trails are shown with mileage to help plan great section hikes and loop trips. Official trails are shown for the the Daniel Boone National Forest and Big South Fork. This map is essential for any exploration of the ST, whether it is for a thru hike or a day hike. We host an interactive web map that users with mobile devices and a data connection can use to locate themselves on the Trace via GPS. Our online map is keyed with our printed map, so they can work together in field. Visit sheltoweetrace.com/hike on your mobile device. Our maps contain official trails in the Daniel Boone National Forest, Big South Fork NRRA, and the state resort parks at Cumberland Falls and Natural Bridge. It shows recreation areas, campgrounds, trailheads, and scenic areas. Read our blog for the Sheltowee Trace. Sheltowee, or Big Turtle, was Daniel Boone's name in his 1778 Shawnee family. Topographic maps at 1:31,680 scale with 50-ft contours, trail mile markers, GPS grids, and detailed hiking info in a rich, full-color 19" x 27" page size folded down to 5" x 7". Lamination waterproofing available via our custom heat press method. 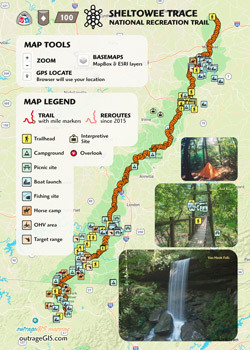 Our south map now contains the official trail network for the Big South Fork National River and Recreation Area. 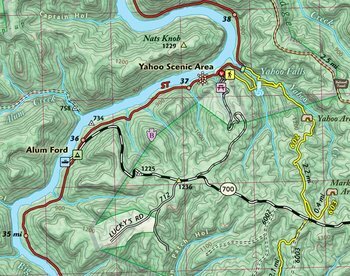 It replaces the older John Muir Trail in the Big South Fork map. News from the Sheltowee Trace Association about Kentucky's long trail, the Sheltowee Trace. Activities in the great outdoors of Kentucky and beyond, focusing mainly on the Daniel Boone National Forest and the Big South Fork.